We are deploying to eastern Nebraska after historic flooding damaged hundreds of homes. UPDATE: Samaritan’s Purse is deploying to Dodge County, Nebraska. Our base of operations for this response is Fremont Alliance Church. Volunteers began work on March 22. Samaritan’s Purse staff arrived in Nebraska today to meet with emergency management officials and local church leaders to determine how we can best serve homeowners devastated by unprecedented flooding. More than 60 counties across eastern Nebraska have been declared in a state of emergency after a powerful “bomb cyclone” pounded the central United States last week. Heavy rains—combined with melting snow—produced swollen and overflowing rivers. We have been monitoring the situation closely for some time. 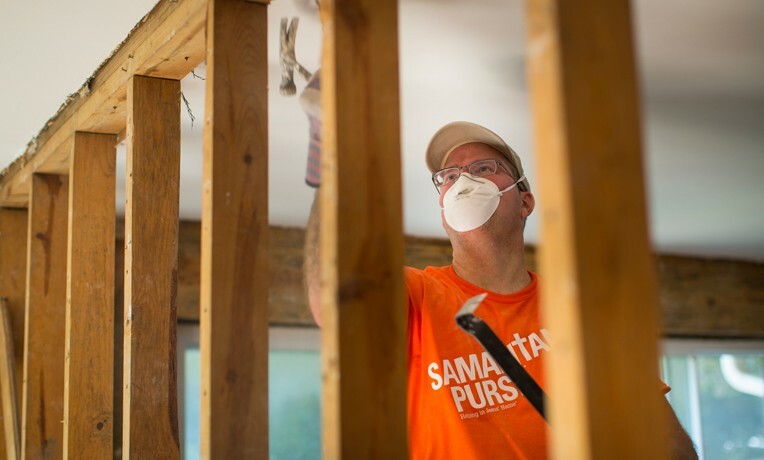 Watching the number of affected homes continue to increase, Samaritan’s Purse has decided to begin assessments in order to be prepared to help those in the hardest-hit areas. A disaster relief unit and supply trailer have been sent to the Midwest. More than 15 points throughout Nebraska have reached record-breaking flood levels. About 500 homes have been damaged in one county alone. Hundreds of people are in shelters after floodwaters forced them to flee their homes. Nearly 300 people in the state have been rescued from the rising waters, with at least three deaths reported. Please pray for our disaster relief staff as they serve in Jesus’ Name. Pray that we can quickly provide relief to families who are hurting and in desperate need in the aftermath of this storm. This article originally published on March 18 and was updated on March 22.